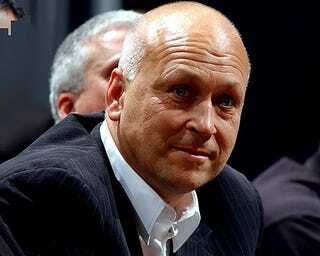 Orioles Combat Flagging Interest By...Turning Down Cal Ripken For A Job? Your team's terrible. Your attendance is worse. What better way to add a little excitement than bringing your franchise's most beloved figure back under the O's umbrella? That's a rhetorical question, unless you're Peter Angelos. Ken Rosenthal's reporting that Ripken approached Andy MacPhail about rejoining the team in some capacity, perhaps working with young hitters. In return, Ripken would learn the administrative side of the job, in preparation for a possible career in the front office. It's a win-win, right? The players win by learning at the feet of a master, and the team wins by having its biggest superstar return to Camden Yards. Well, the idea sounded perfect to everyone except Peter Angelos. Angelos reportedly nixed the idea because he was wary of Ripken receiving credit if the team turns things around (the O's once caught flack for having co-GMs, and there's been a concerted effort to portray MacPhail as being fully in control). Teams do this all the time. Reggie Jackson is a "special advisor" for the Yankees. Johnny Pesky is a "special instructor" on the Red Sox. Teams bring in big names and give them a meaningless title, because it's good PR. But no one's ever accused Angelos of creating good PR.